The Trip Report has been written by all of the participants on the trip. A roster was made up and an exercise book was purchased (thanks Sue). The book was handed around in the order of the roster for the daily entries. Here are the adventures as written by the Crew. We had the maximum allowed 8 cars booked for this trip. 5 of us met at 8am on a pleasant warm Saturday morning at 8am – temperature was heading for the low 30s. 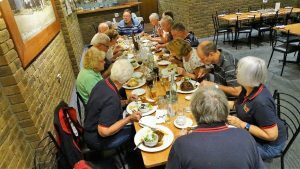 We picked up Deb & Bruce at Munno Para before continuing on the blacktop to Waikerie where we had a morning tea stop at the bakery on the highway. All those who sampled the wares were impressed with the goods. From Waikerie we headed on to Renmark via Monash. From Renmark we headed slightly further north before leaving the bitumen turning off on to the Old Wentworth Rd. We travelled along here for a little way finding a clearing where we could eat lunch and let down tyre pressure for the corrugated road ahead. The lunch spot had little of interest except the tree under which we stood had many items hanging in the branches including caps & shoes as well as a couple of hard hats and right near the top was a witches hat. Once everyone was sufficiently refreshed we headed on the dirt road towards Wentworth via Mt Rufus Road passing Lake Victoria. A reasonably sized wedge tail eagle watched with little interest as the 5 vehicles moved along in convoy towards Wentworth. 1km from Wentworth we stopped for Gary to use his fancy blower to clear the dust off his car. We arrived in Wentworth around 3:30pm, and after a little re-organising had camp set up. 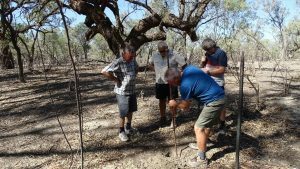 We managed to put our swag up over a bull ant hole so soon moved it to a more suitable location closer to Allan & Celia – a pleasant little spot. We met up with Trevor & Julie and Les & Eileen there at the Willow Bend caravan park in Wentworth as they had taken alternate routes to reach Wentworth. The proprietors of the park had taken over management 3 months ago and were very accommodating even organizing a fire complete with firewood for us. Day 1 was our turn for organizing happy hour nibbles and doing the log so we had to work quickly to make sure people had nibbles early enough as we had been booked in for tea at the Crown Hotel in Wentworth. Very nice meals had by all then a short break on return for a drink by the fire before heading off for some well-earned sleep. Les and Eileen led us on a tour of Wentworth as they lived there 40 odd years ago. We saw the memorial to the “Fergi” (Ferguson tractor) which was a small tractor used by many of the ‘blockies’ during land clearing and to build the town levies. We continued on to the Old Gaol, huge sporting complex while we dodged the town ducks wandering around. We stopped at Lock 10 on the Murry/Darling junction. A large number of pelicans were just swimming around the way pelicans do. We left town and headed to Pooncarie for lunch and had a look at the Old Wharf site. Nothing is left of the wharf but it was a hive of activity during the hey-day of the river boats. 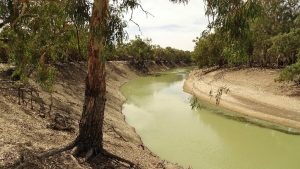 The plaque at the site said that because of the twists and turns of the River the sailing distance from Wentworth to Bourke was 5 times the distance as the crow flies. A couple of our coffee tragics found a café close by. 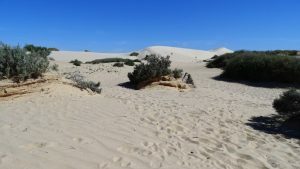 From Pooncarie we drove back the 70 ks to the Lake Mungo National Park where we would be spending a couple of nights. Camp sites have to be booked and paid for in a self-serve kiosk at the Visitors Centre. Cash only. After a bit of confusion we all booked into the camp ground and then had a look around the Visitors Centre. 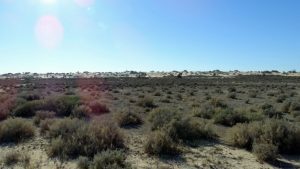 There is a large shearing shed from the era when Lake Mungo was an operating sheep station. Having been brought up on a farm Eileen gave us a running description of how the shed would have been set up and run. 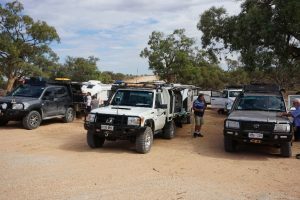 After the inspection of the shed we drove the 3km to the camp ground. 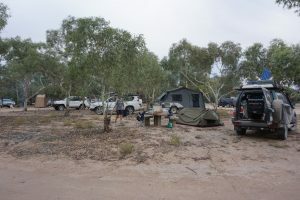 The camp sites are on a first come- first served basis and of course all of the best site were taken. We all eventually found a suitable site and set up for the next two nights. 4 o’clock nibbles were enjoyed. 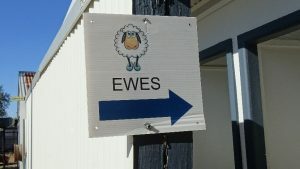 The camp site has long drop toilets and is clean and tidy. Those that were up earlier enough saw another beautiful sun rise. 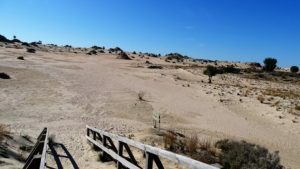 Today’s journey was to take us around the self-drive track of Lake Mungo with the Littlewood’s as our leader. At 8:30 we headed for the Visitors Centre which was the start of the drive. After a wrong turn we were soon on the right track past the old shearing shed. 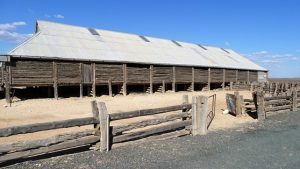 The woolshed was built in 1869 from locally hand cut Cypress Pine. We moved on to Red top tank look out. 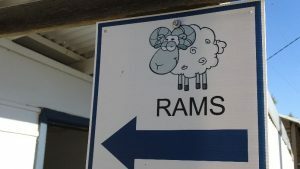 Some of our group were looking for a tank but in NSW they call dams tanks. The Tank was dry but when it does rain (which is not very often in this country) ducks and other water birds visit the area. The above picture from the Red Tank Lookout shows the erosion. Our next stop was for morning tea was at Rosewood Rest where we had shade with tables. 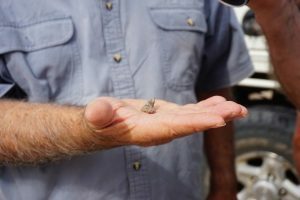 On the track again and we did a quick walk through the Mallee, a good place to spot lizards so the notes said but today the lizards had not read the notes as there were none spotted. From here we dropped into a depression where early settlers established Allen’s Plain Tank. In 1956 it flooded enough to allow water skiing. (Hard to believe today). 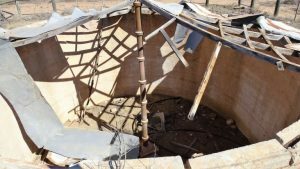 Our next stop was the Belah camp grounds where there was a pit toilet and camp grounds. Round tank picnic area and goat trap was our next stop. Once again Tank was dry. This area is used to trap wild goats as they are in large numbers and cause major damage to the vegetation. Vigars Well was our next stop. Once again with toilets and shade. NSW Parks and Wildlife have done a very good job of looking after the area. 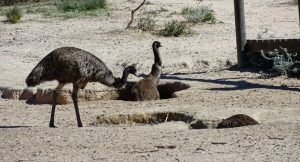 We were amazed to see emus and kangaroos in the hole. This is a natural fresh water soak. A well was dug here and used to water the many drays and coaches that came through this area. Cob and Co came through this area. Back to white sand hills, these are moving east up to 3 metres per year. Our next stop was Zanki homestead. They had it tough back then. 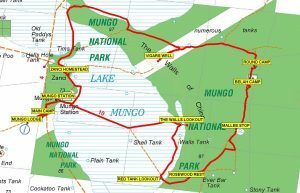 It was then back to the Visitors Centre and the end of the ‘Driving the Mungo’ story. The trip was about 75 km. The parks did a tag along tour of the area and 4 of our group joined the tour. The rest either went back to camp or journeyed to the Mungo Lodge for Scones and Coffee. It was then back to the visitor’s centre for a free hot shower and viewing a video story of the area. Its amazing country from Salt flats, white sand hills, Red sandy country Mallee trees, Blue bush and Salt bush. After a magnificent sunrise as well as a quick update by our fearless leader (Trevor B) we had Bruce and Deb lead off for the day. 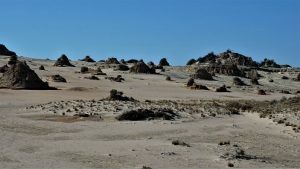 There were many dead trees along the long straight we travelled from Lake Mungo heading for Medindie. These trees would be home for lizards and other small animals. As usual Les was a font on information about this area, he and Eileen lived around this area for a while. Into Pooncarie for morning tea at the previously discovered new café. We crossed to the west side of the Darling River heading for our next camp. 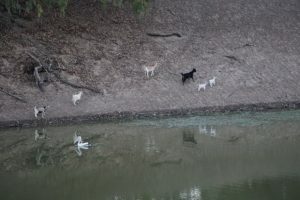 There were quite a few feral goats along the way and everything was exceptionally dry. The dust haze was fairly heavy at times. We found track leading to the river where we had lunch. We arrived in Medindie and had a quick tour of the town and then headed to the Main Weir campground. The large campground is 15 km out of town and we had it to ourselves. The ladies really enjoyed the flush toilets! Les – ever the hunter, put out some yabby traps and surprised himself by catching a few. A lovely evening by the fire capped off a very nice days drive. 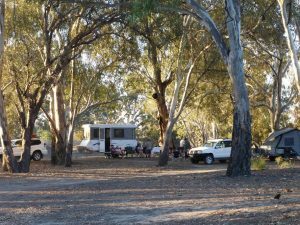 Set off early this morning after spending the night in Menindee at the free, Main Weir campground which was about 15 km out of town. Sue and Geoff were our trip leaders for today and all went into town to fuel up and purchase some supplies. 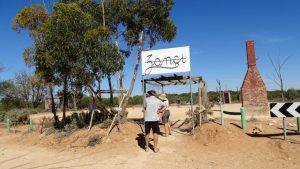 Leisurely drive to Wilcannia along corrugated and dusty roads. 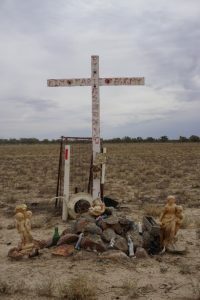 We all stopped to have a look at a memorial in the middle of nowhere. (I haven’t been able to find out what the memorial is about. The names written on it are – Kim & Marie Bugmy RIP 15/2/68 to 26/4/92. Fortunately we did stop because we spotted a flat tyre on the Christian’s ‘truck’. They tried to plug it to no avail so ended up changing the wheel. 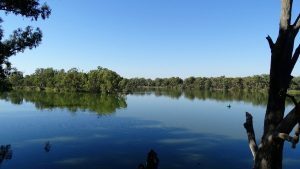 Stopped at the Pardu River for lunch and then at the Warrawong Caravan Park (near Wilcannia) for the night. The facilities at the park are 5 star but the manager mentioned that she had chased 3 snakes out of the office that day. We were very careful to close up our camper that night! After everybody had their showers a great happy hour was enjoyed by all. A day of scattered clouds and sunshine with a welcome breeze to blow away the dust. We had good road conditions, sections of flood plains and recently graded clay surfaces. Travelled about 50 kms from a roadside morning tea reaching Tilpa around midday. 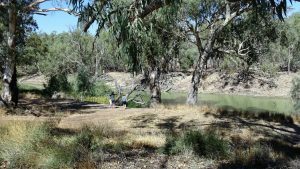 We crossed over to the eastern side and travelled about 6 km to the Tilpa weir campsite. 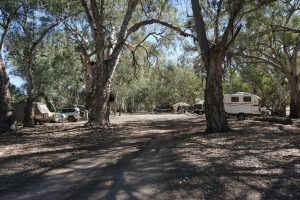 This is a large area with plenty of room for our 8 cars and campers set amongst scattered trees over-looking the river. 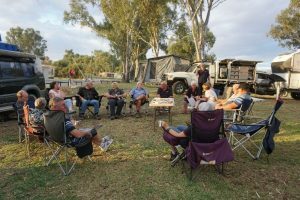 After setting up camp and digging the community long drop we travelled back to the Tilpa Pub for a quiet social drink taking in the ambiance of the iconic surrounds. Back to camp for our daily happy hour(s)! My turn to provide nibbles etc. However, upon preparation found that the twiggy sticks had some mould despite a mid-June expiry date. A camp fire had been lit with some deciding to cook the evening meal using hot coals. Ate our evening meal sitting around the fire watching the eerie sunset silhouetting the trees with the evening star in the back ground. Blest are we with the wonders of nature. It was a VERY crisp morning, some of us needed coats! 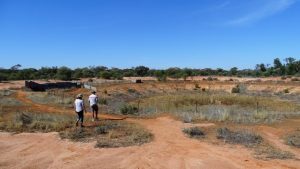 On the road after a leisurely cooked breakfast – heading to Trilby Station, watching out for stock and wild life – travelled 80 odd kilometres to the Station. 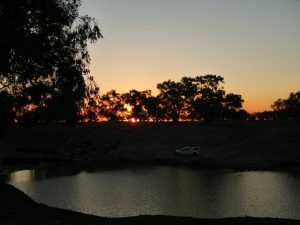 Not much change in scenery – dry, dusty roads, varying in colour from murky grey to outback reds, and a dusty landscape of tired trees and sad paddocks sitting waiting for rain. Many kangaroos in the distance, hopefully munching on the dry bushes. 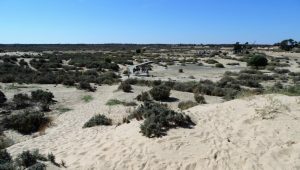 There are about 12 large camp sites along the river spread over several kilometres. 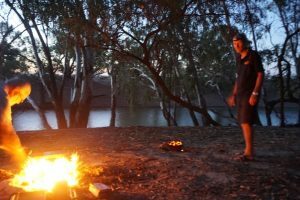 We were allocated Mick’s Camp Ground which turned out to be the last designated camp ground along the river bank. An excellent camp ground with ample shade and a community picnic area with the roof made from a very large satellite receiving dish. After lunch we set off to follow the mud map around the property. Julie entertained us with interesting facts about this huge station. 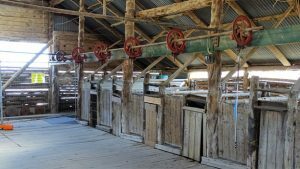 The property is in drought conditions – so the sheep are being fed by sheep feeders, a new mechanical method which ensures the animals get their feed with less waste. The station also farms feral goats. It’s interesting to see the sheep and goats sharing the feed. It’s good to see lots of trees in the paddocks to provide shelter for the stock. In drought times the farmers pump water from the dams to troughs as stock are often too weak to climb up the dams. This huge station has one central water distribution tank which is supplied by pump from a large dam. The water is then distributed around the property, by gravity, through a network of large diameter poly-pipes. We stopped to inspect a hanger alongside of the airstrip that is used in times of flood. Amongst other stuff there was an early model Landover and a treadle sowing machine. Out the back was a double decker bus with the roof ripped off. The property owners encourage folk to visit “New Chum Homestead” – so we stopped & checked out the 50’s style dwelling. Even though in disrepair, it was interesting to explore. Many of us found relics that we recognised from our childhood. It is sobering when you find stuff in a museum that you recognise or used. As the tour had taken longer than expected drinks had to be postponed to 5:00. So it was back to camp for quick showers and drinks. (Lindt chocolates were very popular). Followed by tea and the usual camp fire shenanigans. While on this tour of the property it was easy to see the high water mark for the floods. The soil in the area which gets flooded was a light grey and the non-flood soil was a red colour. The transition was quite obvious. 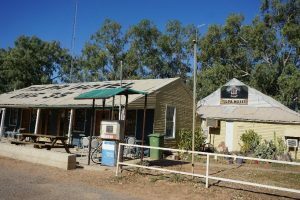 Early morning as usual and our aim to be on the road at 8.30, but first pay our fees for Trilby Station, and eventually on our way at 8.55 am to Bourke. Eileen and Les Butler our trip leaders for the day. Along the way a quick trip into Louth for a look, we noticed some good camping spots along the river’s edge just before going over the bridge. Still travelling on dirt roads, Gordon mentioned he had heard on the radio, that it was Bourke’s PA Show today. 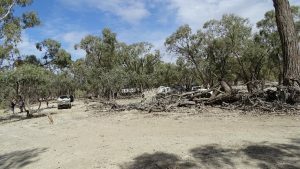 After some discussion about the availability of camping spots, I rang and managed to book the last 8 sites at the Mitchell Caravan Park. 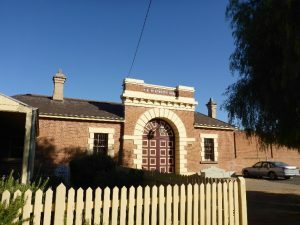 Most people had a look at the Bourke information Centre and associated museum as well as the wharf precinct and the Crossley Engine which was used for many things in many places and finally arrived in Bourke where it was used to pump water. 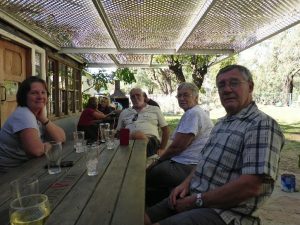 Happy Hour at our campsite, followed by the Bowls Club courtesy bus pickup, and to tea., A Chinese all you can eat meal. Return delivery by the bus after our meal and a few people ventured over for a nightcap and a piece of vanilla slice,,, ending a great trip, good people and fine weather. 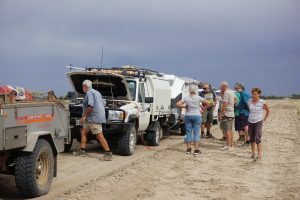 Most people organized themselves for an 8.30 departure in the morning, that is those going back to Adelaide with Trevor. We were staying another night with Judy and Gary before heading home slowly.